This seems like a random post, but I was having a positive, life-affirming moment at Walmart (of all places!) this weekend. I don’t go to Walmart a lot, but sometimes it’s more convenient to go there if you need to pick up some non-grocery items in addition to your weekly grocery shopping. I should start out by saying that I do think the People of Walmart is a hilarious site, but I’ve always wondered where they find those people. I have been to a few different Walmarts in Upstate New York and I don’t know that I’ve ever seen people as crazy or weird as the people that are featured on that site. My sister hates Walmart. She hates it so much, I sometimes drag her in there to hear all of the ridiculous complaints she comes up with. I think it’s usually cheaper than Target, but sometimes the quality of their products isn’t as good, but overall, I harbor no ill will to the place. So I go there on Saturday–literally one of the worst times to go to Walmart because it’s so crowded–and I make a mental note that someone kindly held the door open for me on the way in. 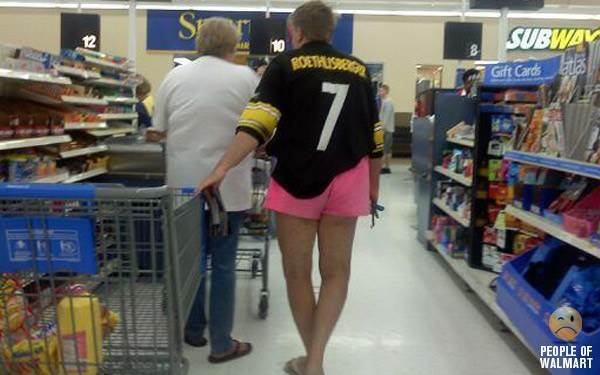 Not the sort of classless people you hear about all the time going to Walmart. It was actually mostly just moms, dads, kids and some assorted teenagers/college students. Contrary to a lot of the images you see online, no one had any obvious stains on their clothes or see-through clothing. Everyone seemed kind of normal. Do I just live in some weird, Bermuda Triangle of Walmart normalcy? Is my experience an aberration or are there lots of “normal” Walmarts out there? 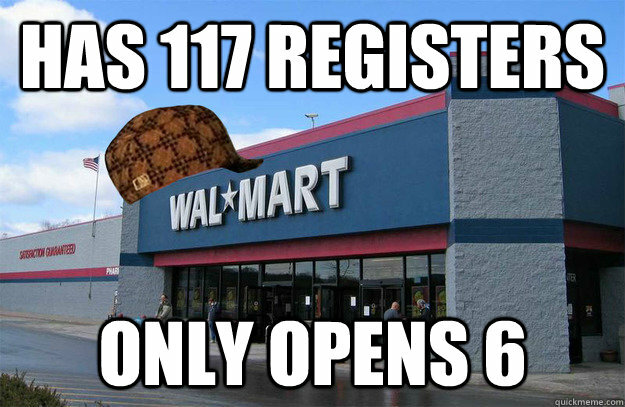 The only problem I usually seem to have with Walmart is their lines on the weekends are terrible! 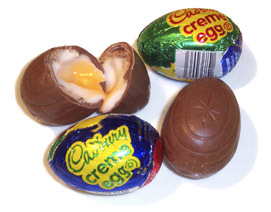 Among the junk food I picked up were some Cadbury Eggs: the most wonderful thing mankind has ever created. They are my favorite Easter candy and I forced my stepdaughter to become addicted to them too. I bought them for her as a surprise. While I was there I also began a rousing debate about whether anyone actually likes Peeps. I saw a half-empty case at Walmart and wondered who is buying them because I’ve met maybe 2 people in my life that actually enjoy them. @knelligan12 Candy corn, peeps and Valentines mini heart candies can all go to hell!!! @knelligan12 peeps taste like death and sadness and sugary cardboard…. I’m excited now that I have a new candy to try–Kab highly recommends the Fruit Punch Jolly Ranchers. I’ve been on the lookout for them ever since. @knelligan12 Fruit Punch all day erryday though. Anyway, fun Peeps-debate outside, as I was leaving another person held open the door for me, breaking the crazy/uncouth Walmarter narrative again. As I was navigating my cart over a small pothole, one of the precious packages of Cadbury Eggs (yes I bought her 2!) fell out and a person getting ready to park noticed, stopped their car and beeped at me so I noticed the dropped item. He didn’t have to do that; he could have kept on going, but he went out of his way to help someone out and I couldn’t help but think how different my experience at Walmart was than what most people have come to expect. I know how lame that sounds and that it wasn’t a bid deal, but I feel like I should pay it forward somehow and point out that the people of my Walmart seem to be pretty nice folks! However, I had to go back in the building because I forgot to get milk and of course, the theme or counter-narrative of this whole post was sort of shattered as I followed an old man into the building who was flapping his arms like he was a bird. I guess there are a few crazies that go to my Walmart. The narrative isn’t completely made up on the People of Walmart site, but if the worst I have to deal with is an old man that thinks he’s a bird, I can live with that.